Read the full magazine below or download a PDF here to view offline. 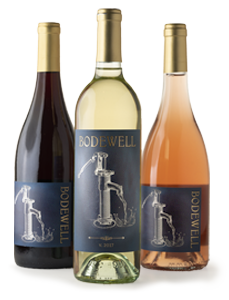 Bodewell has paired with Wine To Water to bring life-saving water to people all over the world. Prepare yourself to take in these powerful stories you are about to read. Settle in and grab a glass of wine or a hot cup of coffee. Witness the strength and courage of the people we have served alongside as our impact runs deeper than water alone. From our generous supporters and donors to our international staff and volunteers, our community is ready to go as far as it takes for those who need clean water around the world. So many extraordinary things are happening at Wine To Water, and there are countless stories to tell. We have chosen a few that need to be told because they capture the spirit of life in service, and the passion for healthy community. Our hope is not only that you will enjoy these stories, but be inspired to create more of your own. We believe in the power of storytelling, and we are excited to share ours with you. Stars possess a power that calms fear. I leaned my head out of the covered speedboat, looked up, and trusted them to do their work. We’d already hit a few unidentified objects in the Amazon on our way back to the dock, and my mind needed some reins. We were supposed to be in Leticia hours ago. None of the other six people seemed worried, although I couldn’t see their faces. Jhonny passed a headlamp to the driver for him to try and see over the dark water. The river had turned out to be more wide and wondrous than I imagined. Just earlier, we’d slowed to spot dolphins jumping in the sunset. “Did you know the Amazon has pink dolphins? !” I would ask everyone I knew once I returned. But my eager curiosity during the hot, humid days morphed into a kind of holy respect for all the unknowns under the cover of night. I’m a stranger in the jungle. Internation Programs Director Josh Elliot (left) and Jhonny Anderson, review project sites and plot their course as they travel down the Amazon River. Our first day navigating the river with Jhonny, he comes to the dock wearing a navy Wine To Water t-shirt, khaki pants, boots, and his trademark safari hat. Although he had left Colombia for a time to pursue music education, Jhonny returned home after a fated meeting with Doc Hendley to become the Amazon national program manager for Wine To Water. Between coordinating volunteer trips, well rehabilitation projects, and filter distributions, Jhonny says he has become a conductor of a different type of orchestra. The Wine To Water team planned to check up on various wells they had rehabilitated in communities along the river, and a videographer and I are tagging along. I learn quickly that Jhonny’s steady smile and demeanor help me feel welcome and assured. Jhonny explains how the nearby river is contaminated with bacteria and polluted by boats and waste. The locals have to rely on ground wells for water, but flooding often makes them inaccessible and many of the wells are broken and unusable. “When you visit a community or village and there’s no water, you can feel it,” Jhonny says. Since Wine To Water Colombia's inception, the primary focus has been to rehabilitate these broken wells so that water can be accessible for years to come. In the past five years, Wine To Water has helped more than 18,000 people here access clean water. Currently, they’re repairing 49 wells in more than 20 communities and providing sanitation and hygiene education. When we arrive at Santa Rosa del Caño, the community leader, a middle-aged man named Robins, greets us in front of an eggshell blue schoolhouse. He is wearing a navy button-down shirt, jean shorts, and sandals. We hear the children asking and answering questions in their class as he leads us behind the building to the well. Jhonny (right) and Robins catch up after surveying the well. The metal cylinder stands on a raised platform to protect it from flooding. Robins gives it a few pumps and water flows freely. “It doesn’t compare to the river does it?” Jhonny asks him. “It’s better. It’s fresh, clean,” Robins replies. Jhonny explains that in dry season, the river virtually disappears. The community endures months without rain. But the well—it keeps on working. Jhonny and Robins catch up on life as our team walks down a grassy path to a second Wine To Water well. We pass a man working on his boat as well as several groups of wooden houses. Sixty families live here in Santa Rosa del Caño. They earn a living by fishing and farming yucca, corn, and plantains and selling the products in nearby towns. Since Wine To Water has repaired their wells, the people have more time and energy to focus on their work and take care of their families. By the time we head back to our boat, a group of kids have come to see us off as we set out for the next location. If Santa Rosa del Caño was once a place where you could sense the despair from lack of water, it sure feels joyful now. For the rest of that day and the second, I watch the team repair wells and foster relationships with community members. We travel to villages built on stilts, one on an island, and a few on top of hills. It may seem like one well looks exactly like the other, but after posting a couple photos on the Wine To Water Instagram, I receive messages from volunteers who helped install them and know exactly what village we are in. They ask about certain people and places, and I am delighted at the strong bonds formed through the well projects. Jhonny talks to us about his experience in bringing all types of people together for this shared purpose. Field Technicians Gustavo (center left) and Gonzalo Jimenez (center right) repair a broken well. I also witness the team’s dedication under challenging circumstances. Pipes, cement, and tools have to be loaded into boats and transported safely down the river for a well rehabilitation. Then, it takes careful labor under the South American sun to do the job right—all with the tricky logistics of having no bathroom and limited food. Sometimes adventure is packaged as an easy, individualist activity, but this quest for clean water is clearly both hard and rewarding for everyone involved. Passion fuels the work. We steal a quiet moment at the end of the second day with Jhonny, sitting by a wooden boat painted pastel green as a woman with long, dark hair wades through the water at a distance. One could argue we stayed too long, as it resulted in the boating-at-night incident. But, when Jhonny talks, we want to listen. As we sail away from Santa Rosa del Caño, we see two boys drift by in their canoe. Insects make their myriad noises as we slowly float under a canopy of trees coming right up out of the water. It’s our last day on the river together, and we’re navigating narrow waterways to tucked-away communities. We disembark at San Jose de los Rios and head up a dirt path to meet Maximo. Jhonny finds him behind his house stirring a pot of fariña. It looks similar to couscous. He needs to stir continuously for four hours in order for the little, yellow pieces to obtain a dry and grainy texture. It’s so hot and smoky under the little shelter that some of our camera equipment stops working. Maximo stirs a massive pot of fariña. The pot holds 15 kilos, and his family earns about $2 USD for each kilo. They repeat this process every week to earn a living, as well as selling other goods, like popsicles. The Wine To Water team had met Maximo and his wife, Aurila, a few weeks prior during a well repair in front of their house. When it had started to rain, everyone brought their things inside. Maximo and Aurila introduced Jhonny to their teenage daughter, who has special needs. The team quickly realized how vital the new well would prove to be. Maximo keeps stirring the fariña while sharing some of his story. “When it’s dry season, we sometimes spend a whole day looking for water. Right now, I can take care of my daughter because I have the well in front of my house,” he says. A little while later, I meet their daughter, who is lying in bed. The family’s freezer sits across the room from her, and their son opens it to pull out one of their acai-flavored popsicles. A bucket with the Sawyer Filter they’re using—given to them by Wine To Water—is on a table next to it. I am inspired seeing a homemade, icy treat in the middle of the jungle, and a family working together with such diligence and creativity. The afternoon rain arrives just in time for Jhonny to break out his guitar. 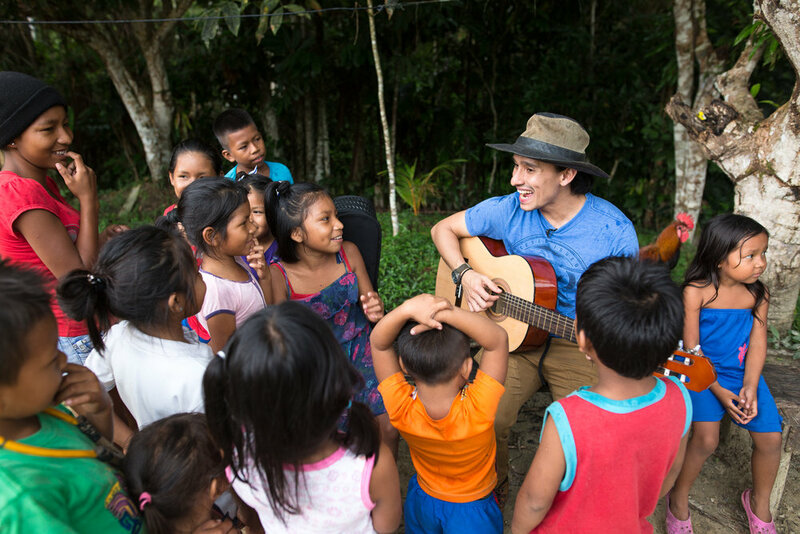 A group of kids gather around him under the shelter of a tree as he begins teaching a song called “el Pobre de Sebastian,” complete with hand motions. I watch toddlers to preteens nervously giggle together as they learn the lyrics and gestures. Their shyness fades as Jhonny keeps teaching. If we could stay longer, I know he would ask them to help translate the song from Spanish into their own indigenous language. Normally, when the Wine To Water team visits villages to complete a well project, Jhonny practices with the kids over several days. It’s one of the intentional ways he sets an example for them. “You are giving something simple like music, but at the same time you are teaching and encouraging the people like, ‘Hey, you can translate that. You can do everything in your community,’” he explains. The journey of bringing clean water is about much more than mechanics. Everyone gives what they can—supplies, songs, food, finances, expertise, helping hands—and the collective effort makes big things possible. “I am not the best, but I know everybody has something good. At this point, I have something that I can bring to the people, and right now it’s here in the jungle,” Jhonny says. Here in San Jose de los Rios, a young girl wearing a blue dress with pink flowers followed us around. A dimple in her right cheek appeared when she smiled. At the end of the day, I heard her humming “el Pobre de Sebastian” as we walked to our boat. Then, she and two other girls stood at the water’s edge. They waved as we backed up, turned around, drove through the narrow inlet and out into the grand Amazon. The little girl in the blue dress, happy to see our team and ready to play, followed us throughout the town of San Jose de los Rios. Many chapters of the Wine To Water Colombia story are yet to be told. While expanding the well rehabilitation process even further beyond these Amazon communities, the team is introducing Sawyer Filters to households, and keeping a steady focus on educating people on sanitation and hygiene. This education is what truly lays the foundation of sustainability, passing down clean water knowledge to future generations. And it’s all happening in community, as people serve together and discover common ground. We all share the stars. Giving to Wine To Water—whatever the amount—makes it possible for people all over the world to enjoy the benefits of clean water, proper sanitation, and effective hygiene. Individually we make donations, while collectively we support life and dignity for all. Give what is right for you. Roshani Karki (left) and Leslie Cuthbert enjoying time together. The rough road caused our vehicle to jar and rattle on the way into Raitole. It’s rainy season here, and we have yet to see if the many high river crossings are going to be impassable. The single road that leads to our destination cuts south through the Chitwan national forest and continues past the village on to India. We arrive with no real delay and see a few locals relaxing on porches and underneath a bamboo gazebo with a thatch roof in front of the town store. It’s hot, the air is thick, and midday has yet to arrive as goats bleat and chickens roam through the village. Everything is lush and green, ready for planting, replanting, picking, and harvesting. It's a good time to be in Nepal. Our driver stops to talk to the store owner as he wipes the sweat from his forehead with a rag. It's quiet here, except for the occasional honking from buses taxiing people to and from India and farther into the Bharatpur region of Nepal. I arrived in Nepal a few days ago on my very first trip with Wine To Water. I’m here to build relationships with the local team, to listen and learn. And I have so, so much to learn. I’m a newbie to this type of travel. I spend most of my time behind a screen, creating content for Wine To Water so people better understand what we do as an organization. How can I do that without going to these places and experiencing them first-hand? Until now, I didn’t fully realize the depth of how important this opportunity truly is. Matt Rath and myself, the communications team, along with Pavan Mudiam and Abhishek Basnet, the field team, are here a day early to get a feel for our surroundings and map out the rest of our trip. CEO David Cuthbert, along with his wife Leslie and National Program Manager Roshani Karki, will be joining us tomorrow. If the Nepal team were pro-athletes, they’d already be in the hall-of-fame for all of the titles they deserve in the relatively short time they’ve been together. One of the key players on their stacked line-up is Abhishek Basnet. Abhishek Basnet shares his story while trekking through the Raitole community. Abhishek ushers Rath, myself, and Pavan around the village, showing us the newly completed water system. He knows this place just as well as any villager, as he’s lived here for a few months now. The people have accepted him as a valued community member, and this level of relationship and trust does not come without hard work, patience, care, and constant presence. Abhishek pours his heart and soul into the work of bringing clean water to the people who have become his family. Rath asks Abhishek about working with Roshani and he doesn’t say much, but not for a lack of feeling on the matter. “Roshani is even more passionate than me about this water project," he says. We’ve been exploring the village for quite some time when the usual overcast sky is consumed by much darker, more ominous clouds rolling in from the south. Getting caught in the rain, we decide to call it a day, thinking about those seven river crossings threatening to keep us from our temporary home in Madi. A young boy from the Raitole community enjoys a refreshing drink of clean water from tap stand #43. There are over 70 tap stands throughout the village, each placed right outside each family’s door. Waking up from a Benadryl-induced night’s sleep, I am surprisingly alert and excited to start the day with a nice aeropress full of Hatchet coffee—a Boone, NC staple. at different times of the day is able to take full affect when it hits your skin. After breakfast, we head out to continue our work, building friendships and capturing the stories of the people in this community. The rest of our team arrives to meet us in Raitole, the site of our newly completed community-wide water program. “Namaste” greetings and hugs are exchanged all around. This is my first time meeting Roshani and I’m a bit nervous, but her kind and gentle demeanor quickly put me at ease. She is the Roshani, the person I’d heard so much about during my short time with the organization. Much of the Wine To Water story we’ve come to capture in Nepal is intertwined with her own, as she has been here since the very beginning. In 2015, a massive 7.8 magnitude earthquake hit Nepal and destroyed so much of the country, but awakened something powerful in Roshani. Her life was shaken on a new trajectory. “I wanted to live here and work for my people,” she said. 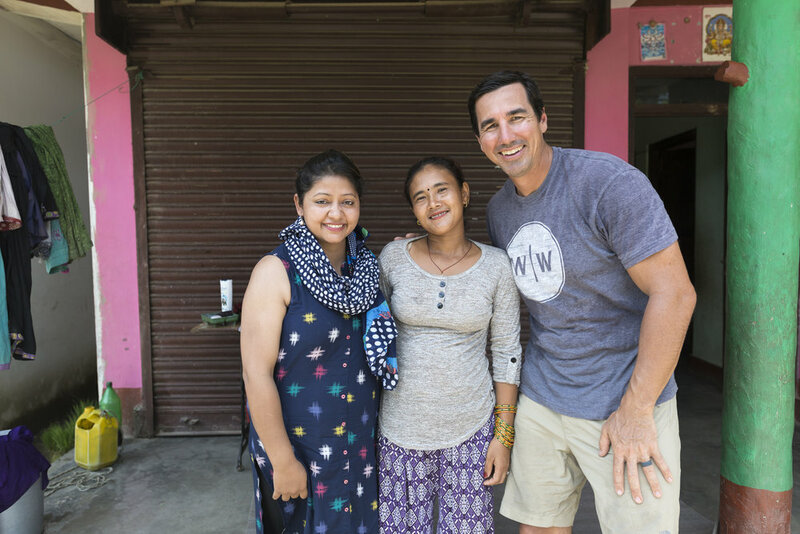 The immediate need was clear, as she and a network of school friends along with a small team from Wine To Water went racing through Nepal on motorcycles distributing Sawyer water filters. This large-scale relief effort was a massive success for Wine To Water. 1,436 filters were implemented, and 3,200 people gained access to clean water in a major time of crisis. Through this effort, David saw first-hand Roshani’s passion for the work happening through Wine To Water. He knew she would be the right person to lead the Nepal office. She has always had vision, but it was now hyper-focused on bringing clean water to Nepal. Roshani and David, along with the rest of the team, walk past the store along a dirt path and up the hill to see the newly-completed, solar-powered well. It’s a deep bore-hole well—48 meters to clean water—that promises to change this town’s future for the better. Water buffalos are anchored to wooden stakes or heavy rocks, allowed to lounge in free puddles, vacant rice fields, and even the creek to stay cool. They sit docile and content, chewing grass and staring aimlessly at their surroundings. Along the way, we meet Sankur Hanijan, an elder of sorts, wearing a bright yellow striped shirt and a traditional Nepali hat. His story is like so many of the others in this village who have struggled their whole lives to gain access to a consistent reliable source of clean water. Abhishek talks with Sankur about the reservoir tank that stores water for the whole community. We hike to the top of the hill, where the water storage reservoir tank sits close to his home. This gravity-fed tank, containing 16,000 liters of water, is enough to feed 71 tap stands, supplying 1,200 people with clean water. Roshani and David continue their conversation with Sankur, and I learn that he is the one who donated his land for the community-wide system so that access to clean water could be right outside each family’s doorstep. “This isn’t just my land,” he tells us. Harikula Sahi (second from the left) shares her powerful story with the team as Roshani translates. As the team continues our tour, Sankur is eager to show us the rest of the village, and we are excited to have the opportunity. Hiking south along a grass-covered jeep path, we head toward the home of Harikula Sahi. In her 70's, she’s one of the sweetest and toughest people in all of the community. Harikula lives with her husband in a stick-built home with wooden siding and dirt floors on southwestern side of the village. Her home is higher on the hill and slightly more remote than most of the other homes, shaded with old growth trees. A few other farm buildings used for storing chickens and a place for drying corn are strategically positioned in her front yard. We arrive in time to enjoy fresh picked mangoes—the best I’ve ever tasted. Roshani and David strike up a conversation with Harikula as she is eager to share her story, not just about the new tap stand that brings water right to her home, but also about her life-long struggle to gain consistent access to this basic need. Roshani translates for the rest of us as Harikula shares how she had heard about the water program at a community meeting. There, she discovered that her house wasn’t a part of the initial project, despite the fact that water was being pumped near her house to the old school building. Harikula demanded to be included in the plan, and her voice was heard. Afterwards, Harikula started volunteering to work on the project. She was always on time to cook, help dig trenches, and lay piping for the project. She and the other villagers were very motivated to finally have access to clean water. Roshani explains that Harikula was building this well for future generations; for her family after she is gone. As the day comes close to an end, the team—especially Rath—wants to explore. We head down the hill, cross the road to the other side of the village and head on toward the river and rice fields. Most of the women of the village are planting rice. The water that floods their fields feels like hot bath water. The gooey soft mud surrounding your bare feet and ankles is a bit unnerving at first, but you get used to it. Combined with the air and water temperature, this wouldn’t be easy to work in all day. These women are tough. The next day, Roshani has one particular person in mind she wants to visit, Naramaya Rai, another strong community leader. Naramaya is a mother of two, and her husband works outside the country for long periods of time to support the family, as many men do in this community. The sacrifice for her husband is great, but the burden of single parenthood is even greater. Roshani tells us that because of Naramaya’s strength of character and leadership, the Raitole community nominated her to be president of the water user group committee. This committee oversees the water program and makes decisions on behalf of the community. Made up of ten members, seven women and three men, this group informs and inspires the community to take real ownership in not only getting clean water to the village, but sustaining it for generations. Roshani explains that because of the commitment of the women in this committee and the village as a whole, the project was completed in half the time. But it isn’t just the women of Raitole; I see this same drive in Roshani too. Roshani and David talk with the Raitole president of the water user group committee, Naramaya Rai (center). Roshani is reluctant to assume the role of a leader, but she is an inspiration to her community and team regardless. Her strength comes from her humility, as her focus is always on others—the betterment of all through the power of community and sustainable, innovative solutions. She has answered her calling to do work that matters and changes lives. Caring for others as deeply as Roshani does is not something that can be taught or learned, and that is what makes her such a strong leader. I imagine she was born with this passion. Though she may not see it, leadership comes naturally for her. Her love for the people and projects ensures that success will be abundant in the work Wine To Water is able to be a part of in Nepal. My time in Nepal has forever changed my life. I am constantly reflecting on the work we are able to accomplish there and the inspiring people that come together so willingly to support and lift one another up in the face of challenges and triumphs. As I’ve heard it said many times: we have as much to learn from the people we serve alongside in community as they do from us. And I certainly found that to be true. One hour and seventeen minutes away from his work at the factory felt like too many for Radhames Carela, Wine To Water's master ceramicist in the Dominican Republic. Our storytelling team was walking through the lush Las Lagunas community, eating melt-in-your-mouth mangoes, and talking to villagers about their water filters that his hands helped create. Those ten fingers crave purpose. They’re at home in clay and restless when not put to use. “Every day, we need to work, make change,” Radha says. You might wonder if he’s including holidays and birthdays. Or perhaps you’d suggest he take a vacation every now and then. Well, surely he’ll want to retire one day, right? Volunteers eagerly mold and prepare locally sourced clay. Radha says people used to call him crazy—like a mad scientist always concocting things, performing experiments with clay, and making machines to improve the factory’s production of bricks and tiles. They saw an unusual amount of time and money spent, but for what? Then one day, a missionary named Lisa Balentine came to him with the clean water filter idea. Lisa witnessed the sickness that water was causing, and felt called to help. Radha was ready. “I said, ‘Don’t worry, we can do it,’” he recalled. Several years later, Doc Hendley visited Lisa and Radha's water filter factory in Moca, just outside of Santiago, where he learned the true worth of their work. Doc initiated a partnership between them and Wine To Water. Then, in 2015, Lisa transitioned ownership of the factory entirely over to Wine To Water to expand their work with communities in the DR. The team has been actively and intentionally involved ever since. So it turns out, Radha’s experimentation with clay and kilns and other processes culminated in this amazingly simple, genius way to help his neighbors and the world. Now, with 11 years and over 80,000 filters under his belt, Radha’s glad he didn’t let the skeptics hold him back. “I never stopped. I continued. If I had listened and stopped, then I would be a crazy man,” he said. at his wheel back in the factory. He wore a light purple t-shirt, khaki shorts, and blue Crocs. With his left foot spinning, eyes focusing, hands pulling and raising the clay, he brought his creation to life. We watched in silence as the piece became a replica of one of the raindrops on the Wine To Water mural. It takes up the entire outside wall of the office. The blue drops are all positioned at a diagonal, like a sheet of rain blown by the wind. Radha had stood in front of his two-story artwork, playfully using the ceramic pieces like drums, each size making a different sound. With a farmer as a father, Radha grew up keenly aware of water’s power. He remembers helping plant seeds and says the most gratifying part came after it rained, when they would start to sprout. He also understands the severe consequences that a lack of water—especially a lack of clean water—can have on a family. Domingo Guzman, DR Factory Manager, prepares the clay that will be used to make the ceramic filters. The Wine To Water team at the ceramic filter factory makes and distributes the clean water filters using a process including, but not limited to, their bare hands, a molding machine, and a kiln. The filters are created by these local workers from a precise mixture of clay, sawdust, nano silver, and water. This results in a porous pot with a layer of activated charcoal to latch onto micro-organisms, and silver to scramble bacterial DNA, prohibiting its reproduction. If I had to describe it to someone, I’d say it looks like a flower pot with a rounded bottom. The filters come in a bucket with a spigot to dispense the clean water. Every time the filters are distributed, the team teaches the recipients how to clean and maintain them for years to come. With proper maintenance, a single filter can provide a family with clean water for 5 years. In short, the filters are made of locally-sourced materials to provide local jobs to help local people. “You only put water into the membrane, and when it flows through the pores in the membrane and has contact with the silver, it’s perfect. It’s clean,” Radha said. The filters often make the difference between sickness and health for families. In the DR, most people buy five gallon jugs from local stores for all their drinking needs. Sealed, bottled water should be clean, but unfortunately, this isn't always the case. The bottled water is often crawling with parasites, as Radha knows firsthand. Just the day before, we had met some of these people in Las Lagunas. 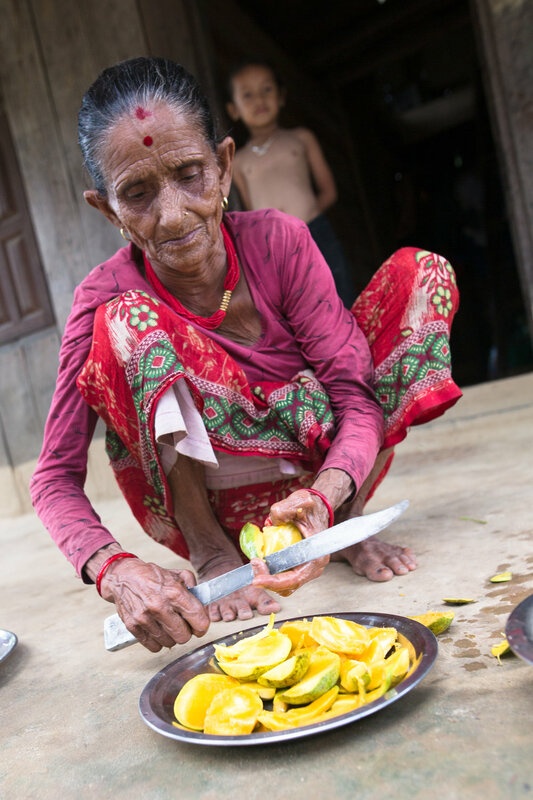 They had given us limoncello fruit from their trees and swapped stories with Radha about their improved health. It felt like a privilege to watch them laugh and pat each other’s backs and over this shared transformation. Along with better health, the filters can also improve a family’s finances since they don’t have to purchase bottled water. Radha says he’s saved about 100 pesos per week since using the filter—a significant amount of money for a family earning an average income. “It changes their economy because they don’t have to buy more water. They don’t need to go to the hospital because the water is going to be safe. Everything changes in their house. The money they used to buy water or go to the hospital, they can use for food. They can buy books for their kids’ school. Everything is different,” Radha said. Volunteer’s watch eagerly as Radha teaches them about the power of this simple, yet life-changing solution that produces clean water. Aside from being a world-class clean water technology, the filters are also used as a platform to teach communities about clean water, sanitation, and hygiene. Healthy kids can go to school. Healthy parents can work and create a bright future for their families. This education empowers people to protect their health for a lifetime. “Wine To Water is serving clean water to the most needy people in the community, but the most important thing is that we continue to teach the people to learn why they need clean water,” Radha said. It’s also equally important for him to help educate his staff at the factory. He knows there’s always a risk in training others that they’ll eventually outgrow you, but he believes it’s one worth taking. The Wine To Water staff members take their jobs seriously—continually performing quality control tests in the factory and looking for ways to improve their product. They also host groups of volunteers throughout the year who travel to the factory to help with production, distribution, and education in surrounding communities. “Every volunteer who comes here is our family,” Radha said. He mentioned volunteers who’ve come several times, and others who stay in touch on social media—creating a wide community, connected by their shared mission. I told Radha that one of the young volunteers we met wants to come back and work with him after college. Marino (left), a filter owner from Las Lagunas, shares his story of improved health thanks to the power of clean water. On our last home visit we went to Fantino, a more urban community, where the water is affected by improper mining. There, our team met Rosana, a wife and working mother of two. She took her lunch break to host us and share about the impact of her Wine To Water filter. I dodged a few toys on my way to the kitchen, where Rosana brewed coffee. Half of her long, dark hair was pulled back, and she wore a white blouse, black slacks, and black loafers. I also tried, somewhat successfully, to entertain her 9-month-old daughter before she speed-crawled back to her mom’s legs. Rosana told us how much she had suffered from the unsafe drinking water. Her stomach had hurt constantly, she couldn’t keep weight on, and her older daughter was often sick too. It was hard to imagine the toll it had taken on her family, when the woman handing us steaming espresso cups now seemed so energetic and cheerful. But Rosana shared that since they acquired the ceramic filter, both she and her daughter have experienced a major turnaround. So much so, that when the baby came along, Rosana decided to only, always give her the purified water from the filter. Thus far, she hasn’t shown any signs of sickness like her mom and older sister. I noted that it may even be the secret power behind her crawling. The filter stood in between Rosana and Radha as they talked in the kitchen, and he encouraged her with his similar story. Then, both of them held a colorful, plastic wine glass underneath the spigot, filled it with clean water, and drank to the last drop. After, we went out on the front porch and played with the baby before Rosana needed to head back to work. I noticed Radha hadn’t asked how many minutes we’d been away from the factory during this visit, but time was surely ticking. Maybe he was distracted by the baby or just better at concealing his restlessness. His readiness at any given moment. “The big problem is the water crisis around the world, and we are ready to stop it,” Radha says. You might wonder how that’s possible. Or perhaps you’d suggest he take a rest every now and then. Well, surely he’ll be finished one day, right? Volunteers are vital to the work we do around the globe. Pick up your shovel and join us.